 A brief, valuable look at the tensions that shaped the 60's, and the cultural and political movements that grew out of them. Farber (History/Barnard; Chicago '68, 1988) covers the period's major issues--the rise of the middle class, the Cold War, the struggles for civil and sexual rights and equality, and the increasing strength of the ``national security apparatus''--with admirable economy, and touches on all of the period's most crucial events. While he seems most at home in chronicling the movement against the Vietnam war and the parallel rise of 60's counterculture, he also does a good job of discussing the civil rights movement, and the ways its failures drove black leaders toward militant, separatist agendas. In tracing these issues, Farber avoids the pitfalls of many 60's analysts, taking care to show the long roots in our history (see Jamison below), and the ways they have pursued us into the present. Farber also sheds light on the role the increasing availability of education played on middle class activism, on the role of the media in the perception of events, and on the impact that developing consumerism had on people like the hippies (with ``lifestyles'' becoming another element in a panoply of ``consumer choice''). Though his sympathies clearly lie with the decade's activists and their deeds, his tone is even. Some of Farber's points are unsupported--whether ``Cold War hysteria and corporate/suburbia conformity'' were really widely discussed among the late-50's intelligentsia is debatable, and as he segues from the Beatles to school prayer, from school busing to Watergate, the sweep of events chronicled becomes less breathtaking than simply vertiginous. The fact is, the whole book's a bit of a sleight-of-hand--the decade and its antecedents can't be covered in such brevity. 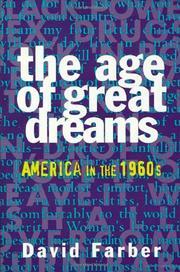 Still, while The Age of Great Dreams doesn't go far or deep in any direction, it illuminates broad areas of 60's life, forming a great introduction to the decade.